Jungle carpet pythons are some of the most beautiful pythons in the world, and are also fairly easy to keep and breed in captivity. A few simple things must be kept in mind when keeping these pythons, and if their needs are met, then they will produce eggs and live a long healthy life. This is a brief care sheet that covers only the basic needs. It is important to watch your pythons to understand further their needs and wants to keep them healthy. Because setups vary from keeper to keeper, there is no exact formula for setting up any reptile, and it is imperative to take any caresheet with a grain of salt and not try to follow rigorously to a care sheet if the animal is having problems. Keeping reptiles is a fluid process, and may be difficult until you understand the needs of the herp and how you can provide for those needs. There are many different ways to achieve the same end, so think for yourself and figure out how you can provide for the needs of your animals. Jungles vary in appearance from dull browns, gray, and black to the more sought after vibrant yellow and black animals. A nice jungle is a hard sight to beat. Jungle carpet pythons are part of the Morelia spilotes complex, which can be a big confusing mess when trying to differentiate between subspecies as they are currently classified. Several studies have been conducted recently using new DNA-based technologies and work is ongoing to classify the carpet complex. Some of these studies suggest that jungle carpet pythons are a nice color and pattern variant of the coastal carpet python (Morelia spilotes mcdowelli), and differ very little from these larger carpet types (Barker and Barker, 1995). Jungle carpet pythons live in the subtropical forests of the Atherton Tableland and have a small range. Despite their small range, there are several distinct locality types which differ in pattern and appearance, which types are typical for a distinct region within the overall range of the snake. Some of the locality types in Australia include Atherton, Tulley, Palmerston, and other locales. I made a jungle "type" page to show the diversity of jungle pattern and color. These picture segments were all "lifted" from pictures posted on an Australian forum of pure Australian jungles, and are simply displayed to illustrate the diversity of jungle carpet python pattern and color. Jungles in the US have had a spotty past, and it is very difficult to be sure that you have a pure jungle carpet. The different subspecies of carpet have been interbred in the early days of carpet breeding, which has cause a lot of confusion for many as to what type of snake they have. While very few can really say with certainty that their snake is from pure jungle origins, many obvious crosses are touted as pure jungles. 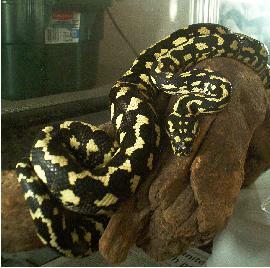 Best bet is to find a breeder that has some history on the origins of their snakes. Otherwise, buy a jungle that looks nice and has the typical pattern and structural characteristics of a jungle carpet. Jungle carpets are easy to keep happy if their minimal needs are met. When keeping any reptile, a thermal gradient is essential for proper function. Appropriate hide areas are another important factor when keeping jungles. These two factors may also be combined to allow proper thermoregulation while in secure hidespots. This is done by stacking inverted shallow wooden boxes on top of one another. The boxes should have an entry hole in the side where the snakes can enter. The box should be shallow enough to allow the snakes to feel like they are secure. Stacking the boxes creates a temperature gradient where the top box is directly under a light bulb and the temperature decreases with lower levels. In the cage pictured, the temperature under the bulb is around 110 F, the first box is around 90 F, the lower box is 85 F and the cage floor is 80 F. This allows the snakes to choose a temperature for a given job. After the snakes have eaten they will generally be found in the upper boxes and move to the lower after digestion is complete. Giving the snakes the temperatures they need when they need them will provide the pythons with the tools they need for proper growth and development. Food is provided weekly. My jungles will come partially out of the nest box when hungry and extend their neck in an S-shape position waiting for a meal to pass by. Jungles will often be picky feeders, refusing rats and preferring mice, but if introduced to rats early on, may be converted to the larger food items. Jungles also relish chicks. I feed a few mice a week to each jungle. Small food items are also more easily digested which means that the energy from mice will be more quickly converted to usable energy. A large water bowl is also provided for water and will also allow for some humidity in the enclosure. Fresh water is given frequently. For some reason, jungle show an aversion to rats, and generally will require that a jungle keeper have plenty of mice on hand. I once had a male that refused food for around 4 months. He was an adult and started losing weight. I tried every trick in the book with frozen/thawed and live mice to no avail. He was in a large cage with the female. During cleaning of the cage, I put him in a holding bin that was much too small for his size. He squeezed inside and when I went to check on him he gave me the hungry look. I happened to have some mice nearby and threw one in. He ate it immediately. He ate three more in succession and I stopped with four to allow him to digest well. After that, I never had any problems with that male regardless of the cage he was in. I guess it just takes a kick start sometimes. He turned out to be a great breeder, with no adverse effects from his prolonged fast. Snakes need to feel secure before they will feel comfortable in the captive environment. Make sure any snake that is kept has a hide area where they barely fit in and feel secure. It's best when they can feel something on top of their body and feel like they can not be pulled out. Make sure you don't mess with them inside their hide area, so they will continually feel this is a safe place (in their minds) and can go there and feel secure. When jungles are in proper health and appropriate size they may ready for breeding. I have tried breeding jungles a couple of different ways and both resulted in an equal amount of success. One pair was cooled and not fed for a couple months during the winter, after which, they were maintained normally and fed well. 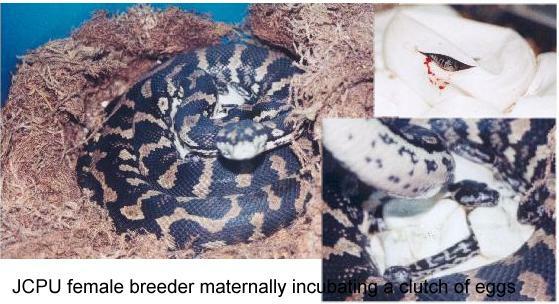 The female from this pair laid a clutch of 8 eggs with one infertile egg for her first clutch. The other pair was maintained at normal temps. There was a normal nightly temp drop down to the high 70's, but higher temps were offered for the duration of the cool months. This pair was also fed regularly and otherwise normally maintained (i.e., there was no special cooling or cycling performed). The female from this pair also laid a normal healthy first clutch of 9 eggs, all of which were fertile. The eggs from this pair were incubated artificially, as I had not prepared the cage for maternal incubation. I had 100% hatch rate (excluding the one infertile egg) from both clutches. I keep all pairs together year round and they will occasionally be observed copulating during the cooler months. The reason for keeping pairs together year round is that they will be able to determine the proper time for productive breeding and the females cycling will not be missed. I think it gives a better chance at success, as the animals know things that I definitely don't. I was a little worried the first few years, because I would only observe breeding infrequently, but I have found that productive breeding does not need to be long and drawn out, and generally when jungles breed for days or weeks at a time, it is non-productive and may waste the males energy. Most seasons I will see my pairs hooked up only once or twice and they produce nice fertile eggs. Many people have devised complex formulas for introducing males and females for certain times of the year, but this may simply limit success. It is often claimed that males kept with females year round will not have a strong drive to breed, but I know from experience that this is false, and hormonal cycles will get a male going just fine. There are many ways to breed jungles, and introducing carpets for certain times out of the year works successfully as well. I only present our results here in case someone was considering keeping a pair together year round. During the breeding season, males will generally stop feeding. After breeding, the females will reduce food intake and may even stop as the eggs occupy more area within the female's body. When the female is obviously gravid, the male is removed so the female can nest in peace. The female is given very slightly moist green moss in a subterranean burrow drawer which is kept at around 89 degrees F. A small water container is also placed in the egg laying chamber for added humidity. After the female lays her eggs and curls around them. I have allowed the females to incubate their own eggs maternally, as nature intended, but this requires several needs to be met. First off, the nesting medium, such as the moss in the picture above, must be dry or very slightly damp on which the female has placed her eggs. If the nesting medium is wet or too damp, this will cause serious problems both to the egg and the nesting female. Humidity is the next issue for maternal incubation. The box needs to be dry on the surface, but the air should have high humidity. It is generally easier to use a plastic container as a nesting chamber to retain humidity. A water bowl is placed within the nesting box, which allows the female to drink and creates high humidity without making the container wet. Another very important factor is temperature. I like to keep the temps fairly constant around 86-87˚F using an undertank heater. 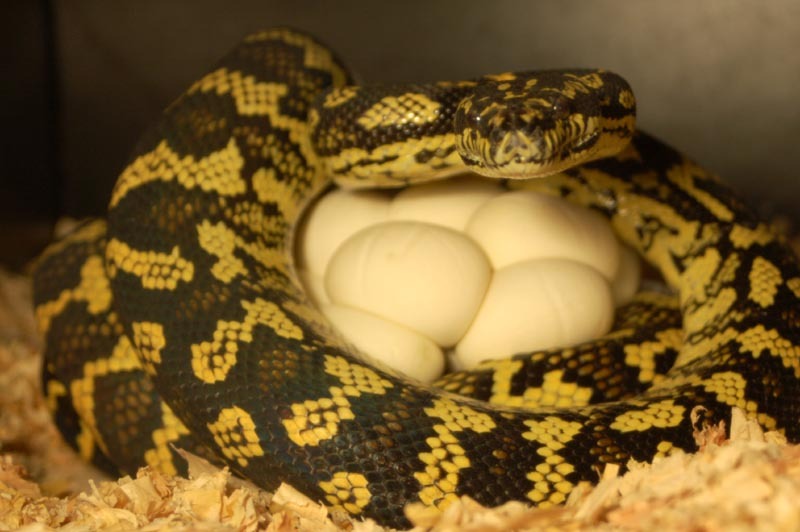 The temps can vary quite a bit, but if the ambient temps are too cool, the female will need to leave the eggs to bask, or will need to shiver to raise the temps of the eggs. This may be stressful to the female, and shivering will use up energy. If the temps are closer to what the eggs need, then the female will have to expend less energy to incubate them, and the females will be in better shape and will be able to recover faster to breed again the following year. There are not many cooler sights than hatchlings emerging from the mothers coils, as you can see in the above picture. Alternatively, and probably more commonly, the eggs can be removed for artificial incubation. I set python eggs up on a mixture of vermiculite and perlite mixed about 50/50. The vermiculite is wetted down and mixed well. Dry perlite is added until the mixture can be compressed loosely into a ball with slight pressure, but dry enough that no water can be squeezed out. This is not an exact science, nor does it need to be. Watch the eggs closely, and if they swell too much or indent too much, then appropriate measures can be taken to correct for the right moisture level. I incubate at temps between 87 and 89˚F, and the eggs will hatch after about 50 days. Baby jungle carpet pythons are ugly ducklings, but with each shed get more and more colorful. It is almost like having a new snake with each shed skin. Jungles will generally get their adult coloration at around 1-2 years. The vibrant yellows of some adults will begin to dull somewhat, but ours have kept their amazing yellows. It is hard to tell just how nice a hatchling will be, but that is half the fun. We, along with many others, have gotten great deals on ugly hatchlings that have developed into trophy adults. The best bet for selecting a baby jungle is to see the parental stock that produced it. Jungles will usually turn out like thier parents, but some will be a bit nicer and some a bit uglier. It is usually just luck when picking out a hatchling. Many people will buy 4 or 5 from a clutch and grow them all up for a year or two and then keep the nicest and sell the rest. One can also hold out and buy a jungle after they have developed their adult colors, but nice jungles at 1 or 2 years command premium prices. Hatchlings will feed on fuzzy mice or pinky rats after a few months. I generally wait to attempt a first feed after the neonate has shed for the first time. Babies generally prefer the larger fuzzy mice as opposed to pinkies. It may be that the fuzzies move around more and elicit a feeding response. Wild jungles likely feed on skinks or other small lizards, but will probably eat whatever they can overpower. Some hatchlings may hold out for several weeks to months before they even take a first meal, and patience is the name of the game with starting a hatchling. I simply offer food items weekly to the babies and hope they decide to eat on their own. If they go too long (several months) assist feeding may be required. The mouth of the python is gently manipulated open and a pre-killed pink mouse is inserted gently into the mouth. The hatchling is then carefully placed back into the cage to finish the eating. Often, simply placing food in the mouth can elicit a feeding response, and usually once they get the first food item down, they will begin feeding on their own. Jungles are fairly large as adults, and it takes a lot of mice to feed a full-grown jungle. For some reason, jungles have an aversion to rats, and many vehemently oppose feeding on rats. I generally feed my jungles mice, because I have a mouse colony and have a large supply on hand. If you would like to switch a jungle to rats, there are different tricks that can be used to switch them over. I generally start by washing the rat pink or fuzzy (depending on the size of the snake) in soap and water (just a little bath) and then "scenting" the rat with mice or soiled mouse shavings. Others have also reported success when "scenting" with chicken broth. Another alternative to get larger food items into mouse-only jungles is to feed African Soft Furred (ASF) rats. Lily, one of our breeder females, is violently opposed to rats and any attempts I have tried to get her to take a rat have failed, but she took an ASF rat right off the bat. The ASF rats are about two to three times the size of an adult mouse, so you need less to feed a full-grown jungle. They are also very prolific breeders as well, so you can keep the meals coming. Jungles are wonderful pythons and their beauty and hardiness in captivity make them ideal captives. Nice jungles are generally the most eye catching snake of any collection with striking patterns and colors and make great display animals. They are perfect for the advanced and beginner keeper alike.